A programmable thermostat makes it easy to save money and the environment by offering pre-programmed settings that regulate your Wallaceburg home’s temperature in both the summer and winter months. Set it and forget it – it’s really that easy! Programmable thermostats can be set to adjust to the temperature of your home according to a user schedule. The programmable thermostats available at Arctic Heating & Cooling can automatically store and repeat settings daily with allowance for manual override. Equipped with a user-friendly digital interface, our programmable thermostats allow for precise temperature control and a wide range of automatic settings. Vacation override, which permits temporary override of the programmed settings. Weekday and weekend programming that allows for sparate schedules on Saturdays and Sundays. An auto season changeover feature that automatically provides heat or cooling at the onset of the appropriate season. A filter change indicator that alerts homeowners when it is time to clean or replace the filters on your heating and cooling units. First alert systems – these systems monitor your home’s temperature while you’re away and can be programmed to notify you in the case of an unscheduled temperature drop. This system also enables you to set your thermostat remotely using your smartphone. Please contact Arctic Heating & Cooling for a specific breakdown of available features. 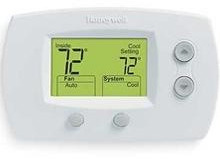 Arctic Heating & Cooling installs only the highest quality programmable thermostats from Honeywell (click on the link to view manufacturer’s website). Honeywell thermostats are the #1 choice for homeowners and include a variety of programmable models. Our customers can choose from 7 day, 5-2 day, 5-1-1 day, and 1-week schedule systems. All of our thermostats come with extended warranties and are installed by a certified professional. For more information on the benefits of programmable thermostats, or to order a system for your home or business, please call Arctic Heating & Cooling directly at (519) 627-6726.